Whether you are a professional chef, an aspiring one, a food enthusiast, or a full-time mom, it is nice to have something in your kitchen that you can depend on to take the daily culinary adventures with. It is nice to have something that understands your needs in the kitchen, that can connect to you, and value what you are trying to achieve whenever you create your culinary masterpieces. This is what Anolon is all about. It understands the value of cooking, eating, and how it connects different facets of our lives to others. This mindset has enabled Anolon to create the perfect cookware that matches not just your cooking needs but also your personality and approach to cooking. That is why ever since the company launched the first ever flat surface gourmet hard anodized cookware in 1989 until today, it never stops innovating and improving to keep up with the world’s fast-paced growth and advancement. Why should you trust Anolon? Quick tips in choosing your Anolon sets. Anolon has been around the cookware business since 1984. The company has dedicated itself to making innovative cookware that is not just beautiful in design but also dependable and fully functional. The experience that Anolon has makes them trustworthy to bring in the best cookware all the time. Anolon not only has been in the business for so long but also is a leader in the kitchenware industry. The dedication of the company to innovate and provide the best cookware has earned the trust of customers worldwide that enabled them to broaden their ventures. As of today, Anolon is also one of the top brands in terms of cutlery, bakeware, and even tools and gadgets. This is how the company maintains credibility and leadership. Anolon has always been a leader when it comes to new technology in cookware. The company is the first one launching the hard anodized cookware in 1989. It also was the first to incorporate Santoprene to cookware handles to provide more grip and control during cooking. In 2009, the company took the first step in applying a copper layer base to the hard anodized frame to improve cooking and durability. Until today, the company never stops to evolve into something that today’s world need. With Anolon cookware, you get to experience the technology and innovation in cooking the company provides through these exclusive features. This trademark construction is available to most of Anolon’s cookware. The hard anodized solid construction is not just for durability and toughness. It also provides even heat distribution for balance all around cooking. It also induces heat retention so the cookware continues to cook the food even after the source of heat has been switched off. With this sturdy technology, you can be assured that your cookware will stay with you for a long period of time. This triple-layer nonstick surface promotes health by allowing you to cook without oil. It is PFOA-free, ensuring that your family is safe from harmful toxic chemicals. This technology provides maximum food release and easy clean-up. This nonstick surface is also tough enough to withstand the use metal utensil without scratching and peeling off. It also aids in the proper cooking of food. For your omelets or frozen bacons, this non-stick option is a good choice. This innovation surpasses normal stay-cool handles by providing more control in cooking. It places a soft silicone coating over the stainless steel handle to give maximum grip and control without feeling the heat of the pan. The handles are oven safe up to 400°F. You can just efficiently put the pan directly from the stove to the oven and pull it back out safely and easily. With this features, the need to remove the lid and release moisture and flavor is minimized, since you can look at your food and monitor it even with the lid on. It is break-resistant and oven safe, allowing you to focus more on your cooking than in your cookware. The limited lifetime warranty varies for each product, so make sure to know what is covered. 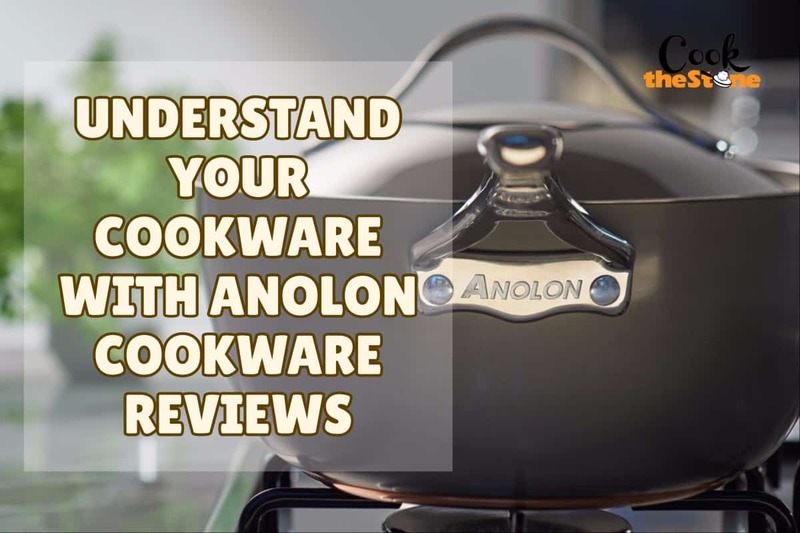 This feature provides you peace of mind knowing that Anolon backs its products up and will handle issues concerning its cookware. There is no question about the quality, durability, and elegance of the Anolon cookware. The only consideration you have to take is merely personal preference. You have to understand that not all Anolon cookwares are versatile enough to be used on any stove top. But there are some Analon cookware sets that are compatible with most stove tops, including induction heat. You have to decide on whether to go with the hard anodized aluminum or the stainless steel. Comparing the pros and cons, and what features can be let go for the other. The important thing is both durable and carries the same feature of even heat distribution. This is a matter of preference. Being budget conscious is not a concern since even lower tier Anolon products enjoy the same quality and performance with the high-tier ones. Here are going to have the best Anolon cookware reviews for each of these bestsellers. 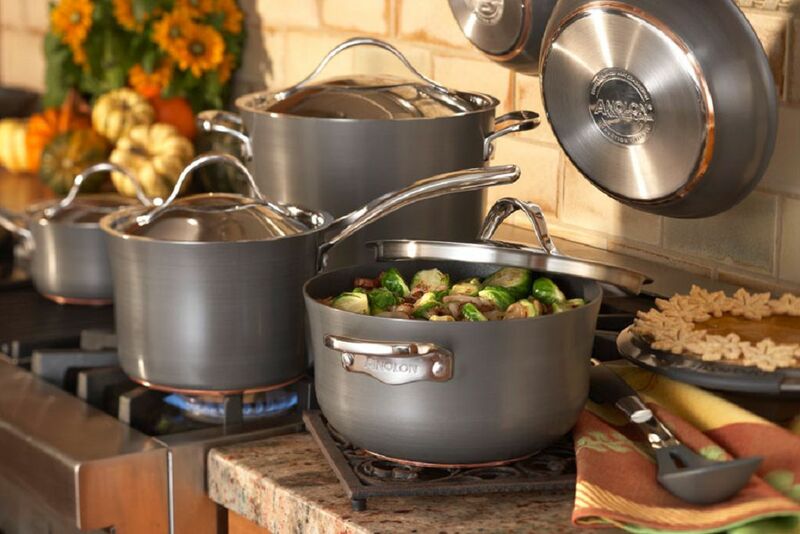 This premium piece set includes 1.5-quart and 3-qt covered saucepans, 8-quart covered stockpot, 8-inch and 10-inch open skillets, 3-quart covered sauté pan and 12-inch shallow grill pan all with the Anolon Advanced Bronze feature that showcases a unique warm bronze pallet that exudes elegance and prestige. Its hard-gauge anodized aluminum built is engineered for durability and even heat distribution. It comes with a triple-layer nonstick coating, break-resistant lids, and the Suregrip silicone covered stainless steel handles. Its high-gauge, hard-anodized body is built to last and cook food completely with even heat distribution. The PFOA-free non-stick coating promotes health by allowing cooking with less oil. 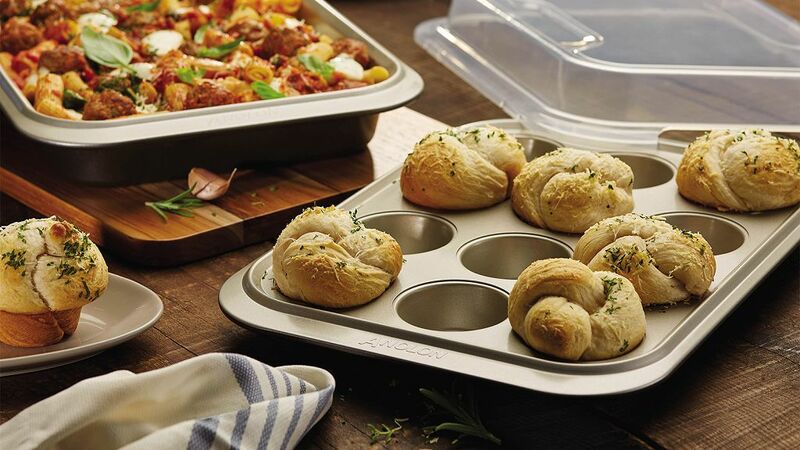 Suregrip handles and break-resistant lids are oven-safe for more efficient cooking. Its beautiful and elegant design will complement any kitchen. The packaging needs improvement as it arrives just in cardboard boxes. The main feature of this cookware line is the copper core double full cap base which is infused with the hard anodized construction. Of course, it is hard to miss the elegance of the Nouvelle Copper design that makes its an eye-candy for any kitchen. It has everything that Anolon has to offer. It has the same even heat distribution capability. It has the superior nonstick interior that allows healthy options without oil, stainless steel handle for more grip and stay-cool capabilities, and stainless steel lids that lock in moisture and flavor. It has a copper core dual full cap base combined with hard anodized aluminum for more durability and enhanced heat distribution and retention. The PFOA Autograph 2 non-stick materials are safe for the family and has superior non-stick capabilities. It is compatible with induction heat stove tops. The stainless steel stay-cool handle with the flush rivet technology prevents food particles from getting stuck on the rivets. The set doesn’t have the SureGrip silicone covered handles. This cookware set is built with heavy gauge hard anodized aluminum that makes it durable, lightweight, and distribute heat evenly throughout the cookware to ensure balanced cooking. It is oven safe up to 400°F with the stay-cool Sure Grip silicone infused stainless steel handles and break-resistant tempered glass dome shaped lids that allow easy transition from stove-top to oven to counter. It also features the Autograph 2 non-stick system that is PFOA-free and safe from harmful toxins. It is tough enough to withstand the use of metal utensils. Its high-gauge, hard-anodized aluminum body makes this set durable and lightweight. It also allows even heat distribution and heat retention to allow balanced, complete, and energy efficient cooking. An elegant design can be matched with any kitchen. The SureGrip handles, silicone covered stainless steel handles, enhances grip and stays cool even while cooking. It has break-proof tempered glass lids that lock in moisture and flavor and allows the monitor of food without opening the lid. 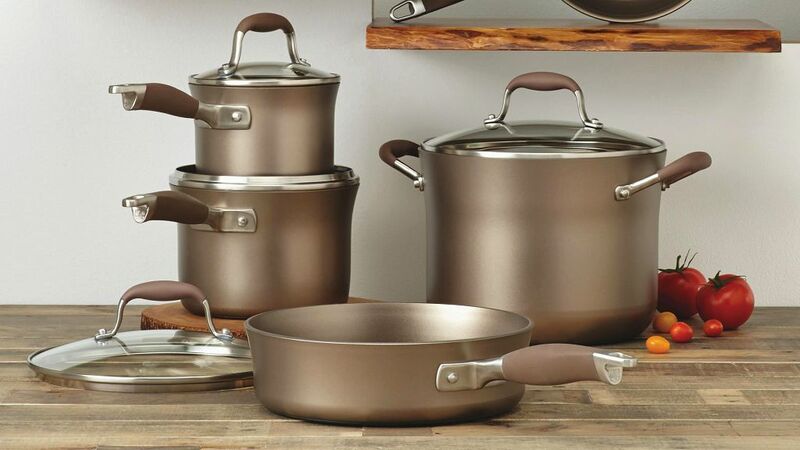 Another beautiful set from the Nouvelle line, this cookware features the same double full-cap base in which a layer of aluminum is infused with a layer of copper and covered with another layer of aluminum finished with a magnetic stainless steel base. It also sports a stainless steel structure that makes it durable and beautiful at the same time. Stainless steel handles are double-riveted to ensure stability and control. Its dome shaped lids ensure that moisture and flavor are tightly sealed. When it comes to elegance, the aluminum steel body embodies prestige and looks good at any kitchen. Its double-cap copper base allows better even heat distribution and faster heating time. It is safe to use on all stove tops including induction heat. Its long, stay-cool, stainless steel handles are are double-riveted for optimum control and stability. Its stainless steel body beautiful and at the same time durable. It is oven safe for up to 400°F and also dishwasher safe. It doesn’t have a nonstick interior surface. This set is another success with Anolon combining beauty with functionality. Its hard anodized structure is durable and at the same time allows even heat distribution for balanced cooking. The set has a bronze exteriors and chocolate interiors making it look elegant and prestigious. Cooking your favorite sautés and omelets can never be easier with its PFOA-free nonstick surface that allows easy flipping, tossing, mixing, and optimum food release. It is also equipped with SureGrip silicone covered stainless steel handles which are oven safe for up to 400°F. Monitor your food without lifting the lid and releasing moisture and flavor with the break-resistant tempered glass lids. It carries the Anolon limited lifetime warranty. It is made of hard-anodized aluminum that makes it durable and enhances even heat distribution. The PFOA non-stick surface keeps the family safe from harmful chemicals and at the same time allows quick food release and easy cleaning. The SureGrip technology on its handles allows better grip and control. It is oven safe for up to 400°F. It carries the Anolon limited lifetime warranty. The packaging can be more enticing than just cardboard boxes. Even your kitchen could be decorated with full of stuffs like halogen convection oven or full different kinds of knife from the boning knife to the butcher kife, I’m sure that you can not miss a cookware set. It is actually difficult to determine the best among these because all of the items are almost identical to each other in terms of features. But as far as versatility is concerned, my most favorite one is the Anolon Nouvelle Copper Hard Anodized Nonstick 11-Piece Cookware Set. It has almost all the features Anolon can offer except for the SureGrip handles and the tempered glass lids. But the tradeoff is that due to the copper infusion you can use it with induction heat stoves.